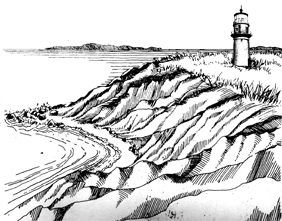 The Gay Head Light has been a fixture on the clay cliffs in Aquinnah since 1856, a beacon for mariners and a Martha's Vineyard icon. With erosion putting the brick lighthouse perilously close to the edge of the cliffs, it will be moved 135 feet inward this spring in a much-watched effort to preserve the landmark for generations to come. Next week the PBS science series Nova will air Operation Lighthouse Rescue, a film documenting the effort to relocate the Gay Head Light. Mariners, the U.S. Coast Guard and the National Oceanic and Atmospheric Administration are updating their charts to account for the light’s relocation away from the eroding cliffs. Under a steady downpour on Tuesday, the Gay Head Light resumed its watch over Vineyard Sound and the waters off Aquinnah. A large crowd gathered in Aquinnah Circle, peering up from under their umbrellas and hoods to witness the end of the lighthouse’s longest period of darkness since 1856. Richard Skidmore and Joan LeLacheur, keepers of the Gay Head Light, have lived by the particular rhythms of the Gay Head Light for 25 years, tending to its mishaps and arranging countless visits with people from around the world.